Gardening books are either aspirational or educational. With its brightly coloured pages and photos, Millie Ross’ The Thrifty Gardener comes across as aspirational but unlike other aspirational gardening books, striking architectural plants and stunning aspects do not feature. Instead, The Thrifty Gardener’s aesthetics lean towards the ‘nanna-chic garden’: there’s fruit and vegetables amongst the flowers and the structural elements of the garden such as walls, paths and water features are DIY-ed from salvaged items. Aimed at the beginner to intermediate gardener, the book starts with planning and design, before moving into specific tutorials that range from propagation to small and large projects such as newspaper pots and clay fire pits. The latter half is much more educational with plant terminology, composting, pests, and soil types demystified. The final chapter lists a variety of edible plants. Little of the material is new. You’ll find instructions on how to strike cuttings in most domestic gardening resources. You’ll also find most of Ross’ plants in books that specialise in food gardening and or kitchen gardens, usually with more detail. And there are already books about sustainable and permaculture practices. What differentiates The Thrifty Gardener from the others is its drive towards economy as well as sustainability. Not only does Ross advocate ‘re-use, recycle or reconsider’, she also shows you how to do it cheaply; there’s rules for tip scavenging and advice on how to make the most from out-of-date seeds. Only edible plants make the final chapter, probably because they give hip-pocket-friendly returns, with ‘perennial performers’ getting top billing because they ‘look just as good as they taste,…keep producing for years, and take less water and time than seasonal vegetables’. There are, of course, books that already look into gardening on the cheap. There’s Dave Hamilton’s Grow Your Food For Free (Well, Almost). 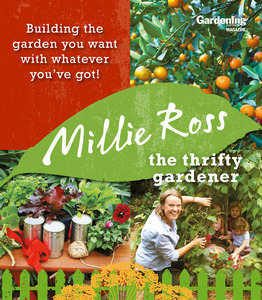 There’s even a book with the same title, Alys Fowler’s The Thrifty Gardener. Both are British, however, and lack the local focus that Ross delivers in spades: projects that nurture native critters, a whole chapter dedicated to water resources, and plant profiles that consider climate preference, water needs, and weed potential. Early on, Ross notes that ‘Localism just might be the new black, especially in the garden’. Her book The Thrifty Gardener makes for a convincing argument: there is only so much in a UK or US publication that is relevant to the Australian garden, for the nitty gritty, it’s best to go with titles that are homegrown.